Ever since e-readers came to existence, there’s been an on-going debate over how reading with real, physical books completely overshadows reading with an e-book reader. While both parties are entitled to state their opinions, nobody can deny the benefits of having an e-reader; the most obvious one being that it allows for thousands of books to be stored in just one light-weight device. 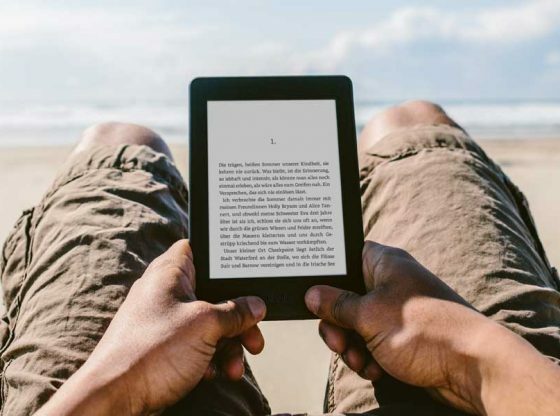 Others compare them to tablets, but nowadays most E-readers utilize E Ink technology, which is gentle on the eyes, especially for reading in direct sunlight; and these devices’ batteries last long periods of times, lasting 4-6 weeks in one single charge. Selecting our pick for best reader was a very tough decision, but by a very small margin the place goes to Kobo Aura One. This reader has a huge 7.8-inch E-ink touchscreen paired up with an ultra-high 1,872×1,404 resolution, and a 300-pixels per inch display, which needless to say, makes for a very neat visual experience. Such a large screen may bother some people, mainly because one-handed reading may not be possible for some; however, the back of the Aura One has a rubber-like material to make one-handed grips a little easier. Aura One’s only weighs 230 g, and its design doesn’t vary much from that of most e-readers and retains the typical grey color, as well as a slick, and minimalistic design. 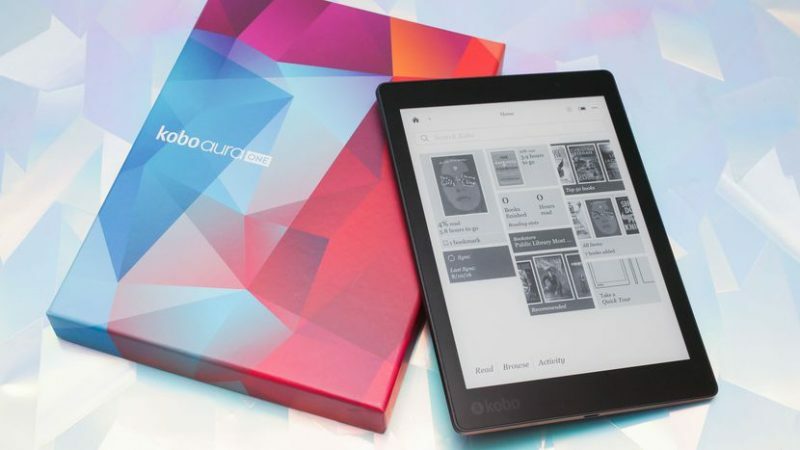 Additionally, Kobo Aura One is fully waterproof (although it doesn’t float), boasting of an IPX8 rating, meaning up to 2 meters, for up to 60 minutes. But what really landed this e-reader in the first spot was that it supports a large number of e-book formats, CBZ and CBR included (for comic-book lovers), which is a big plus compared with any Kindle reader. The reader is decidedly on the pricier side, at $230, though it’s not the most expensive of the list. Nevertheless, paying that amount of money is totally worth it considering the reader has an 8GB of storage, which translates to thousands of books at the palm of your hands. Our runner-up slot goes undoubtedly to Amazon Kindle Oasis, which also happens to be Kindle’s luxury high-end, ultimate e-book reader, packed with the best specs, in both hardware and software. For this list we’ve obviously picked Amazon Kindle Oasis’s 2017 version, first because it’s the newest one, and second because it clearly is the better of the two (not that there’s something particularly lacking with the first version to begin with). Oasis boasts Kindle’s biggest screen as of yet, at 7 inches, with a 300 ppi display. Also, the reader is extremely light-weight and thin, considering the battery can last up to six weeks with only an hour’s worth of charging. Kindle really outdid itself with the aesthetic of the Oasis with a smooth and elegant aluminum back, which is just the cherry on top to elevate this reader to a luxury-item status. For audiobook lovers, Oasis supports Audible playback. Unfortunately, the device doesn’t come with a headphone jack, but there is a Bluetooth connectivity that lets you connect to headphones or speakers. 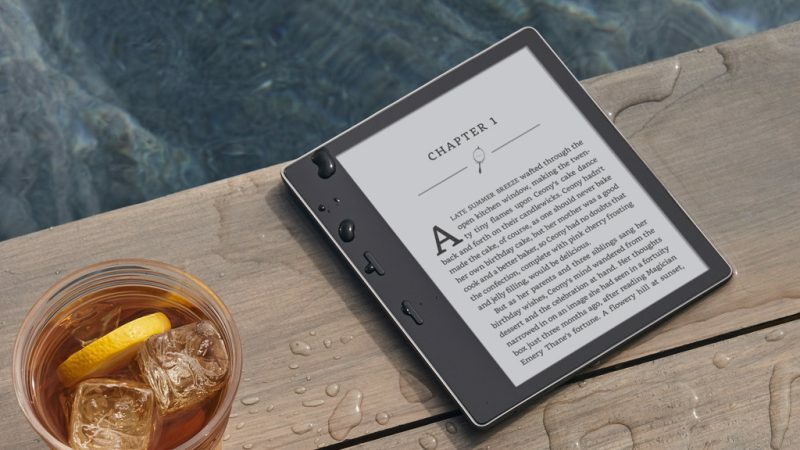 To top it off, Oasis is also Kindle’s first waterproof e-reader, with an IPX8 rating, making it possible to read in pools and beaches. The only drawback: The price. Currently at $230 with 8GB of storage, and $350 with 32GB of storage plus Wi-Fi connectivity. The Next best thing in Kindle’s repertoire comes in the shape of one Kindle Paperwhite. It is worth mentioning, in this mini review that we’re alluding to Paperwhite’s latest edition, i.e. the 2015 version. 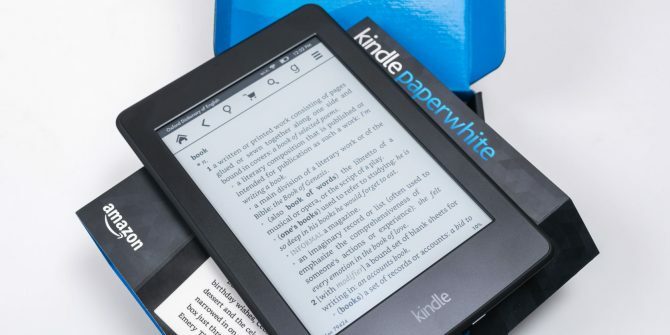 While it’s not as flashy, nor is it waterproof, Paperwhite possesses all the essential features for the average reader, with of course, some tweaks here and there that have been done over the years, to each new version. This particular version has a 6-inch E Ink HD touchscreen and a 300 ppi display which translates to sharp and crisp texts, with the very welcomed addition of a special type of font called “Bookearly” that reduces eye-straining and allows for fast reading. The display also comes equipped with 4 LED lights across both sides of it, in case of late night reading. Battery-life-wise, the device lasts up to six weeks on a single charge, so basically it’s pretty standard, but nonetheless much appreciated. Comparably, the storage in the Paperwhite is considerably less than the previous two names on this list, with 4 GB; still, that’s enough space to store up to 4000 books, potentially more than the average person’s going to read in a lifetime. All in all, Paperwhite is a very good e-reader, if you’re not too demanding when it comes to some features. Besides, it is way cheaper than most, currently at $120.